Prepare deposits faster, easier, and more accurately! Our Pre-Inked Endorsement Stamp imprints your banking information in a customizable format. No messy ink pads to dry out. Clear impressions reduce risk of mistakes.Custom layout allows you to include exactly what you want or what your financial institution requires. Popular 3-line format contains: For Deposit Only, Company Name, and Account Number. Improves accuracy by imprinting your bank information and your account number. Please remember to include these with your order. Impression area measures 1 13/16" x 1 1/16". Popular 3-line format contains: For Deposit Only, Company Name, and Account Number. 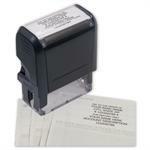 - see Product D2023-A to have pre-printed info. For instructions on re-inking your stamp click here. 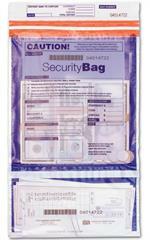 53858 Dual Pocket Deposit Bag Clear Front Opaque Back 9 1/2 x 15"